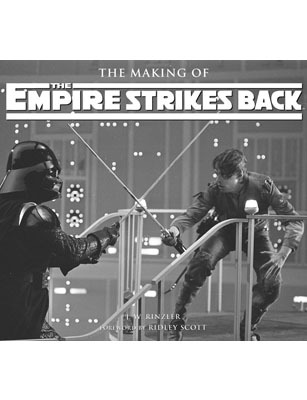 For Star Wars fans for whom no time is too long ago and no galaxy too far away, this lavish, Wookiee-sized compendium is the definitive guide to the making of the second (and arguably, best) installment of George Lucas' space opera. It's all here: unseen early artwork, discarded plot treatments and storylines (at one point in development, Yoda was envisioned as a bearded dwarf called Minch; in another, he was to be played by a monkey in a costume) and interviews with the cast and crew. The "here's how it was" anecdotes abound: you can almost taste the ice-cold spaghetti the crew dined on during a subzero cold snap in Norway where they were filming the Hoth ice planet scenes. But the book's best, most telling passage is the extended transcript of an on-set dialogue between director Irvin Kirschner, his crew and the actors in which they construct, virtually from scratch, the climactic carbon-freezing scene in which Princess Leia finally declares her love for Han Solo. (Han's famous response  "I know"  was Harrison Ford's idea.) Like The Making Of itself, it's an engrossing look at the cooperative, creative process behind one of cinema's most indelible gems.